Made in Italy, the state-of-the art Silentaire Sil-Air 50-24-V is the professional solution to air brush craft creation. Perfect for an air brush artist that seeks a flexible compressor model, the Sil-Air 50-24-V outperforms other units in pressure and consistent delivery of paint application. Used by professional artists, the Silentaire 50-24-V is a portable unit that allows for easy management of air supply on larger projects. The Sil-Air line of compressors is silent, enabling air brushing to be performed without environmental noise. Completely automatic, the 50-24-V by Silentaire comes equipped with an air tank, pressure regulator, built-in moisture trap, tank pressure gauge and line pressure gauge. 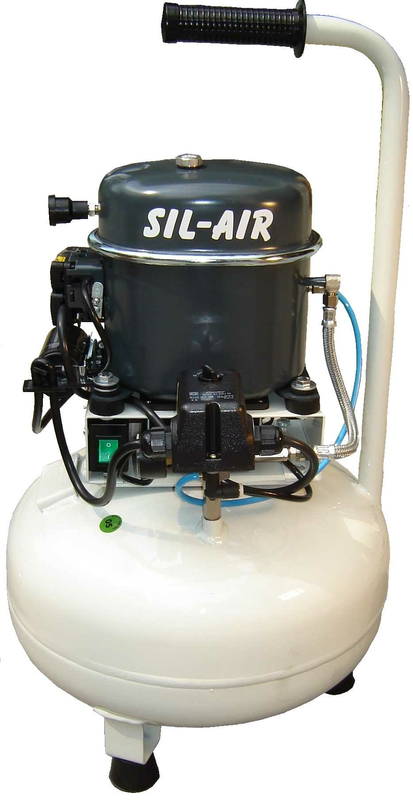 Also outfitted with a safety valve, easy clear air intake filter, and comfortable carry handle and wheels, Sil-Air compressors are the ultimate light weight, heavy-duty 1/2 horsepower engine air brush pump. The unit is offered in 220volt/60Hz and 220volt/50Hz voltages.